Kooka (pronounced Coka, like the soft drink, is the shortened name of an Australia bird called the kookaburra. What is this thing with the bike industry and birds? Avocet, Ibis and now Kooka) Well, the name "Billet" pretty much lets it out of the bag, this is a stem machined from a single piece of 7075 aluminum alloy. The machining is performed on a computer controller milling machine, known generally is a Computer Numeric Controlled (CNC) milling machine. With the proper programming it takes pre- defined shape of billet aluminum and using a rotating cutter, cuts away all the un-desired material to leave the desired finished shape. This is becoming a very popular way of making things, because long or large production runs are un-necessary. To change what you are making, your need only change the CNC program, stored on disc, put in the proper aluminum billet, and start the new run. Deep inventories are no longer a requirement of sucessful business. The Kooka stem is an Aheadset stem, for use with threadless fork steerers. The piece begins as a 1 3/4" wide and 1 3/4" tall block of aluminum that is 7 inches long. The interior horizontal cutting is the first performed, including the the large cavities, the steerer clamp holes, the front binder relief and every thing involved in making the side profile including the 25.4mm inner diameter handlebar hole at the front. The proper profile is achieved by milling away the same area, to make a matching profile from each side. The cutter, when machining the profile, moves just half way into the piece. Then the piece is turned over and the same cutting is replicated from the other side. The thicker top and bottom walls are 5.1mm thick while the two interior joining walls separating the inner cavities are 2.0mm thick. Once both side profiles have been cut the piece is turned upside down, to cut the steerer hole and the center away from the binder fittings, and finally to create the top down perimeter cutting of the piece. The Kooka uses two handlebar binders. As a last machining step, the piece is pitched at an angle and the binder holes are drilled from the front at an downward angle. Once tapped with threads for the binder bolts, they are sawn through leaving a 2mm wide kerf that makes the cinch mechanism. Unlike other Ahead (threadless) stems the Kooka doesn't require a separate aluminum cap to provide a bolted down lid over the Star Fangled Nut. The Kooka has countersunk hole on the top where the cap would be and comes with a matching counter sunk bolt with a 4mm hex fitting for the headset. 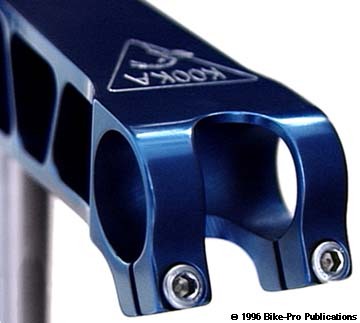 The Kooka uses two internal clamps machined from aluminum rod. Two pieces of 12.7mm diameter rod form each clamp. The clamp pieces each have quarter round hollows on the inner end, one piece is drilled and threaded, the other is drilled to recess the bolt head and allow the bolt to pass through. A single 5mm x .8mm thread pitch with an 18mm length, weighing 3.5 grams with a 4mm hex fitting passes through the non- threaded clamp piece anchoring into the threaded piece. As the two quarter- round ends are drawn closer by the bolt's tightening, they constrict and clamp onto the steerer. The steel binder bolts are 5mm x.8mm with a 16mm length, 4mm hex fitting and 3.5 grams weight. The Kooka Billet come in three diameters, 1" 1 1/8" or 1 1/4", in three lengths 120mm, or 135mm, in two rises 0 degree or +10 degree. The Kooka stem comes anodized in 7 colors, Blue, Black, Gold, Green, Lavender, Red, or Silver. The weight of the 1 1/4" Kooka Billet stem in the 135mm length, 0 degree rise with cap bolt is 252.5 grams.